Under the motto “Competence with Koch – Expand your capabilities with Koch”, Werner Koch Maschinentechnik GmbH will present its revamped control technology for central material supply systems as well as the new Micro+ dryer at Fakuma 2012. The new control system of Koch-Technik has been upgraded both visually and technically. The symbols have been adapted for use with an intuitive touch control panel. As with the Koch graphic display software, the entire material supply process, with all its components, has been depicted graphically and adapted for multi-touchscreen software. The processor can now monitor and control the system on a portable control module. Simply touch a single component with an associated symbol, for example a feed separator, and all the relevant control and adjustment parameters are displayed. Koch-Technik supplies a modified tablet PC, which functions as a portable control module, and is wirelessly linked to the ‘brain’ of the system, the Siemens PLC control. This mobile touchscreen tablet serves as an extension of the control system for the complete material supply process. The operator can now keep an eye on the whole system from anywhere in the production area, the company says. It is possible to check material requirements and the activity of the material supply system at a glance. 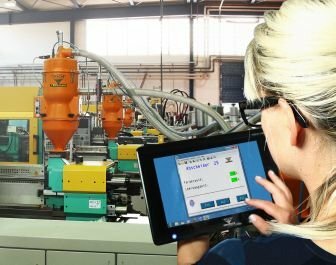 Using the tablet, the operator can also make real-time adjustments there and then to individual components such as material conveyors, vacuum pumps and safety filters. Meanwhile, the upgraded granulate dryer Micro+ for very small volumes is developed by Fasti-Koch under the umbrella of Koch-Technik. It is the second dryer, after the Xpert+, to be given a completely new control unit. Both dryers, featuring ERD compressed air technology, are designed to provide gentle drying of plastics such as ABS, PA and PP. The Micro+ comes with glass drying containers of 0.5-3L depending on version.